Our Pasting & Touching Table is ideal for planning and viewing transparencies, art work, press jobs etc. Specially Acrylic sheet over light source cuts reflection. The Five durable steel drawers in our table provide convenient storage space. 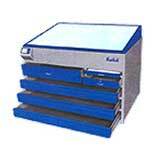 We are a reliable pasting table exporter and one of the renowned touching table suppliers in India.